Click Here to Go Back To Part 2! This entry has turned out to be even longer than the last (I had a particularly busy Day 4!) so lets just dive right in! Most of today was spent at the Magic Bus office, giving me time to get some work done for the UK office, meet more wonderful Magic Bus staff, work on the blog and digest everything I saw yesterday. As I alluded to in my last post, my feelings about what I saw, both good and bad, were not tempered by a good night’s sleep. Tomorrow I’m visiting Dharavi to finally see a Magic Bus session and to see the community. This is like jumping out of the frying pan and into the fire. Chamunda Naga was very small and home to around 200 people. Dharavi is the worlds third-largest slum and home to 700,000 people. I’m not sure what to expect, but it’s not going to be easy. Today started bright and early at the Dharavi Sports Club, a space for sports and physical activity near the edge of one of the largest slums in the world. Rupesh, Aarti and I had arrived just in time for a Magic Bus session. We were met with a spirited “Pilelo-Ho!” by around 30 kids, split 50-50 between girls and boys. They were taking part in an icebreaking game, a fun way to start each session and get everyone warmed up and ready to go. This time of year, kids in India are off from school and get to enjoy a break from studying, and the subjects of Magic Bus sessions reflect that. Why emphasise the importance of going to school when kids the schools aren’t open? So, today’s session focused on the importance of staying hydrated when out playing, how to recognise the symptoms of dehydration, and what to do if you become dehydrated. All excellent advice on this, another scorching Mumbai day. 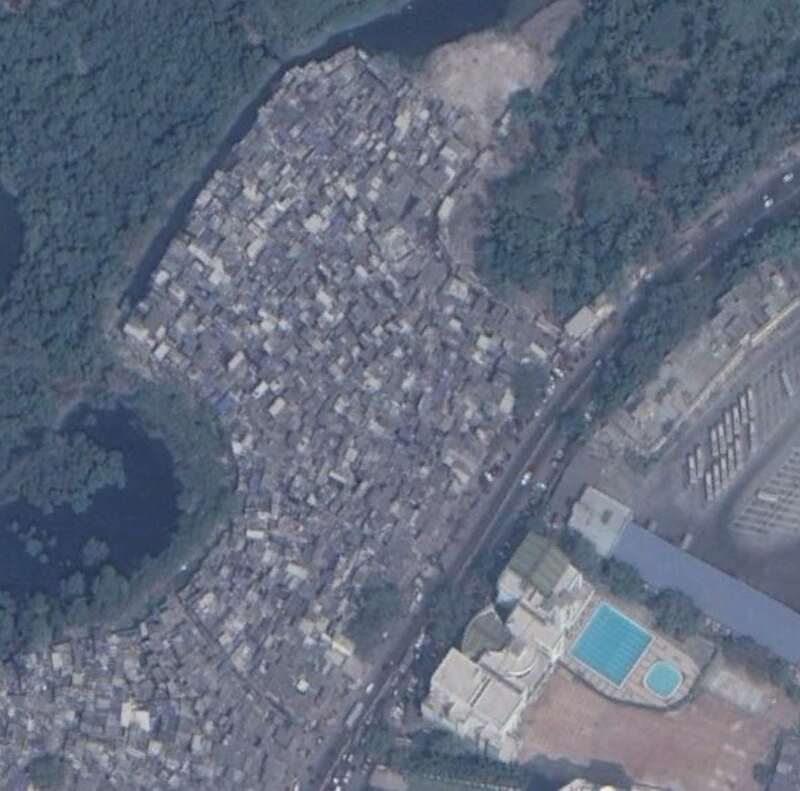 A satellite photo of the part of Dharavi I visited. In the bottom left of the image you can see the sports complex where Magic Bus holds its sessions for this community. Click to Expand. The session started proper with a game of Call Response as the CYLs (Community Youth Leader) and a TMO (Training & Monitoring Officer) told the story of a man with a long beard who always took water with him to school. I didn’t get it, but the kids clearly thought it was hilarious! This done, the kids moved onto another game. It was a lot like a game of “It” or “Tag”, where a team of kids had to chase the other team around a square, all while hopping on one foot. As I understand it, the frustrations of the “hopping” team, who had a very tough time trying to catch their running opponents, was meant to represent what happens when you don’t drink enough water. Long story short, it’s not nice. The teams swapped so everyone could get a taste of this before the game moved on to part two. This time the hopping team were allowed to run instead and had a much easier time catching people. This represented drinking plenty of water: by doing so, it was less frustrating and overall you got to have more fun. After the games, the kids sat down for a little group discussion with the CYLs to talk about what they had learnt. It was clear the lessons had gotten through, as everyone was making sure to drink plenty of water as they sat in the shade of a nearby tree. Once the discussion was over, it was time for a game of good old-fashioned football to end the session. As I watched the kids taking part in the session, I was immediately struck by their boundless enthusiasm. These kids were clearly having a lot of fun and were really engaging with the lessons during the session. It was an absolute delight to see the kids having so much fun. I hadn’t yet visited the community in which they lived, but I knew that they didn’t have easy lives; that without this kind of intervention they would be trapped in poverty forever. I’m sure we’ve all seen the impact statistics that show that Magic Bus is having an obvious impact: 0% of girls married before 18, 99% of children regularly attending school etc. But watching these kids play it was obvious Magic Bus is having a positive impact that can’t be measured with tables and statistics. These were happy children, full of life and confidence, that when given the kind of support Magic Bus is offering, could take on the world and live the kind of lives that they would otherwise have been denied. I’m still angry at the injustice that I saw a Chamunda Nagar (and would see in Dharavi), but to see the kids at the Magic Bus session, I’m filled with renewed hope and faith that Magic Bus can bring about extraordinary, positive change for thousands of children. Credit has to go the TMO, CYLs too! They brought just as much enthusiasm as the kids and helped to make an otherwise dull message about hydration fun and exciting for everyone. It was obvious the kids looked up to them and I learned later on that they are held in high regard by the rest of the community for the support and advice they give outside of the sessions not just to the kids, but the parents too. The support we give to Parents is something I hope to bring up more in Magic Bus UK’s communications in the near future. While it’s not the main focus of our work, by involving the parents, we ensure the lessons taught in sessions stick once the kids get home. Not only that, we’re helping parents to become organised, to help them collectively bring improvements to their communities that they could not achieve alone. It’s evidence of a much broader impact, one that we’ve not done enough to talk about up to now. With the session over, Rupesh, Aarti and I headed over to the community in Dharavi where the kids lived. Like Chamunda Nagar it is an illegal settlement, meaning it was built on land not designated for slums by the government and therefore receives no support. Both communities have similar problems, but this part of Dharavi is so much worse. Like Chamunda Nagar, there are restrictions on water. There are taps for every four houses, which only function for half an hour a day. Evidence that the community has tried to work around this tight restriction are visible everywhere. A jerry-rigged network or pipes ran down the tiny streets to ensure water is distributed evenly and large water butts can be seen everywhere to make sure there’s some water available throughout the day. Because the government provides no support, the water for this part of Dharavi is supplied by a “Water Mafia”, which means exactly what it sounds like. They charge extortionate rates for just half an hour’s water access, above and beyond what the average Indian has to pay for non-stop access. With no government support, people have no choice but to suffer extortion. Public defecation is a widespread, one which I never saw, but could certainly smell. None of the homes have a toilet. There are public toilets available, but they cost 5 rupees per person to access, money that people can’t afford to give up. Animals roam free, exacerbating the problem of waste. When we arrived at the community, we didn’t stick around for long. Not out of any concern for our safety, but because we had arrived when the taps were running. With only half-an-hour to collect as much water as possible, to wash and clean as best as possible, we were keen not to get in the way and waste anyone’s time. As we walked the narrow passages, I had to constantly pay attention to avoid hitting my head on a low roof, tripping on steps, slipping in sewage, or getting caught by electrical cables. The smell was nauseating as the odour of human waste permeated throughout. There were sections so heavily built up that almost no light could get in, trapping the heat and smells. I’ve never suffered from claustrophobia but walking through these cramped lanes was a deeply unsettling experience, one that I’m not going to forget for a very long time. Where I could, a stole a glance at the homes. Unlike Chamunda Nagar, the buildings are all permanent, made of stone and brick. Each one is no bigger than your average British kitchen, serving as a living space for at least 5 people per home. Most were at least two stories, a separate home on each floor, with a rickety ladder giving access to the house up top. I cannot begin to imagine what this community must deal with during the monsoon season. The streets will be flooded with water, spreading sewage, human and animal waste everywhere. Many of the houses are built bellow the level of the streets and will be flooded with filth. Diseases like typhoid and cholera, which will already run rampant, will be exacerbated by the monsoons. The problem of disease is made worse by a lack of education, as the community will often fall back on traditional remedies to try and cure disease. We briefly spoke to a mother who told us that her son had recently been bitten by a dog. To prevent disease, he had been treated with a traditional remedy: giving the wound a wipe with a brush. While we were quick to insist that she take her son to a doctor for a vaccination, thousands of others will suffer unnecessarily due to a lack of education. This type of slum is common across India and the problems are often similar. As of 2013, 65 million men, women and children live in conditions like this in India. That’s the entire population of the UK living in inhumane conditions, and the problem is only going to get worse. Proof, if it were needed, that Magic Bus’ work is more vital than ever to help children escape this nightmare. At one point during our visit we stopped at the community’s rubbish dump, sat on the edge of the area, but still right next to some of the homes. In the distance, across a mangrove swamp, we could see one of Mumbai’s many business clusters, filled with ultra-modern skyscrapers that housed some of the world’s biggest companies, familiar to both you and I. This is a very vivid reminder that India is a deeply divided country. It is quickly becoming a major player on the world stage, one where everyone is keen to do business. It would be ridiculous to ignore the fact that India has benefited enormously from all this investment, the overall decline in poverty in the last 50 years can be partly attributed to that. But millions are still getting left behind, trapped in appalling conditions with no hope of escape without a serious intervention. This is what Magic Bus is doing. By reaching out to children at a young age and working with them right through to when they start working, Magic Bus is ensuring that kids and young people have the necessary hard and soft skills necessary to find sustainable employment and escape from poverty. Which brings us to the last stop of the day, a Magic Bus Livelihood Centre, just 5 minutes’ walk away. The Magic Bus Livelihood programme is aimed squarely at young adults who are looking to start working or enter into further education. It focusses on more tangible skills like spoken English, IT literacy, CV writing, and interview skills. Then once those skills are in place, Magic Bus provides placements at relevant companies or organisations such as Marks & Spencer’s, Kidzania, or local Colleges. For the next 6 months, Magic Bus checks in with the individual to ensure they are progressing well or if they need additional support. For many of these young people, working in a retail or office environment is totally brand new, most times it’s not even something their parents will have done. So that additional support helps make sure employment remains sustainable for the long term. Most astonishingly is that all the training is completed in 45 days: 8 weeks, Monday to Friday. The results speak for themselves: at this centre, around 70% of young people find sustainable employment with a decent salary. At another Livelihood Centre next to Magic Bus head office, the success rate is around 90%. The average across all the centres is 70% of young people placed into sustainable employment with a good salary. What I think makes the Magic Bus livelihood programme special is its commitment to the individual’s desires. It doesn’t try to force people into whatever job is available. Even if a certain career is unavailable, there’s generally a suitable alternative offered. The Livelihood Centre I visited offered a great example of this. A young woman arrived wanting to be a doctor, this was her dream. Unfortunately, and through no fault of her own, she hadn’t taken the necessary courses at school to start medical training. The only alternative was to pay a large sum (something in the area of 10,000 rupees, an impossible sum). So Magic Bus presented her with two alternatives. There were two courses available onto which she could enrol: training to become an X-Ray Technician, or training to become an Operating Theatre Technician. While neither would let her become a doctor, both would allow her to work in medicine and to help the sick. Today this young woman is an OR Technician at Mumbai Hospital, one of many young people who have gone on to become medical technician’s through the programme. I think the livelihood programme serves as proof that Magic Bus is achieving its ultimate goal: getting children and young people out of poverty. By starting early, at the age of 12, our main programme is providing children with soft skills such as confidence, resilience and self-efficacy. This lays a strong foundation to develop the hard skills necessary for work through the livelihood programme. This ultimately translates into the high success rate of young people finding, and staying in, work. I should add that right now not every child who goes through the main programme enters the livelihood programme. As the livelihood programme is only a few years old, the resources aren’t there yet, but that is the goal: that one day every child that enrols in the Magic Bus programme at the age of12, eventually graduates from the livelihood programme and into sustainable employment, completing their journey out of poverty.